All children have the desire and the ability to be successful, you just have to know how to get it out of them. Dr. Sylvia Rimm discusses reveals some of her parenting tips on how to do just that. This week I had the absolute fortune of interviewing Dr. Sylvia Rimm. I am sure that many of you have heard of Dr. Rimm. She had a regular segment on the Today Show for nine years. She is also a best-selling author of books such as “See Jane Win,” “How Jane Won,” “Rescuing the Emotional Lives of Overweight Children,” and “How to Parent So Children Will Learn” to name a few. Dr. Rimm is also a clinical professor at Case Western Reserve University School of Medicine and she is the director of the Family Achievement Clinic in Cleveland, OH. I was very grateful that she was able to give me an interview. Dr. Rimm has done extensive research on children that are gifted, children that are underachievers and overweight children and is considered among the top elite when it comes to many different parenting issues, families and issues that trouble tweens and teens. As you can imagine along with be grateful for her time I was overwhelmed with questions I wanted to ask. If you visit her website you will have access to more information then I could cover here, as well as you have the opportunity send Dr. Rimm your question about parenting and have her answer it. For our talk what she and focused on were really ground rules for parenting. The reason is because in her research she has found there are certain things that parents of happy, successful and achieving children do to help make sure that their children excel, that other parents aren’t doing when it comes to parenting their children. After talking with Dr. Rimm, I was relieved to know that my husband and I were doing most of them… and that I found out the areas we need to tweak alittle to get better results. The first “pillar” we will call it has to do with the words you use. The words that you use with your child to discuss that child, as well as the words you use about that child to other people are what helps to mold that child. Your words are actually the building blocks to the identity you child has. Dr. Rimm says that it is important that we are using positive words when we are talking to our children or when we are talking about them. I know this first hand based on experience with our son. To me it only made sense that if you want your child to do well that you talk about the good things about them. No child is perfect, put focusing on their flaws does not help motivate them or push them to be the best they can be. As parents we need to think before we talk about our kids. Of course we don’t want to overdo it. This is another point that Dr. Rimm brings up. Over praise can sometimes have the same affect that under praising children has. We are all guilty of over praise. When our children are small and they do something we tend to tell them that they are the best in the whole world at whatever it is they did. When they are small that is fine, but over time they tend to believe that they are the best and then when they interact with the world around them and they find out that they are not the best, that there are people that are better than they are they start to question their own abilities. As our children got older, instead of telling them they were the best we told them that we were so proud of what they accomplished. When they would ask if they were the best in the world, it was hard at first to tell them that we thought they were the best, but that there is always room for improvement in everybody. While I didn’t run that by Dr. Rimm, I think it helped our children always look for ways to get even better at what they were doing. The next pillar is “united parenting” and this is a BIGGGIE. It is very very important that children to do not see their parents as the ogre and the savior. That one parent is going to be more lenient than the other parent, and that parents are consistent because each child may view who the ogre and the savior is differently. In our house we are very proud of the fact that we have done the united parenting from the get-go. United parenting helps eliminate the children playing one parent against the other, and it helps children learn what mom says goes, or if they go to dad first, what dad says goes. 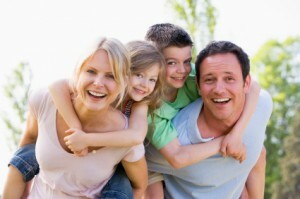 Dr. Rimm is a firm believer is united parenting based on all the research she has done. Unfortunately this is an area that many parents need to work on. She recommends that you talk about your parenting goals, away from the children. That any differences you and your spouse have you work on or find a compromise on so that when your children come to you they are getting the same response from both parents. Dr. Rimm also says that it is important that you talk positively about your spouse to your children. You don’t have to praise them as if they are the best thing in the world, but you do need to point out their strong points, the qualities you admired. The next pillar is “focus on the strengths” of your child. Not every little boy was born to be the next Babe Ruth, Michael Jordan or Walter Payton. Not every little boy can be the all star quarterback. Not every little girl wants to be Mia Hamm or Brittany Spears. You have to look at your child for the individual that they are and focus on their strengths. As you work on the strengths you will also be able to help them improve their less strong points. For example if your child is very creative and gifted when it comes to drawing and writing, don’t focus on the fact that they are not competitive and don’t have a desire to be in sports. Praise them for what they are really good at, and encourage them to try new things. Another pillar is “setting realistic small goals.” If your child wants to go to Harvard, then you can’t focus on going to Harvard, you have to focus on all the little things that are going to help your child get there. If your child is overweight and you want to help them get healthy, then you can’t overhaul everything they are doing, you need to start small and work your way to the bigger goal. They will get there with positive reinforcement and your encouragement. Finally, “lead by example.” Think about how much sense it makes to tell your child to get up and be active while you lay on the couch with a bag of chips. Or my favorite, tell your child not to hit as you smack him or her for hitting. Don’t send your child mixed messages, be the role model your child looks up to. You don’t have to be the CEO of the company, but you should take pride in what you do and do your best at it. This will help your child strive to be the best. It is never too late to start according to Dr. Rimm, but it is always easier if you have the pillars from the beginning. You can help your child become the successful person they were meant to be. My two cents, for everyone that ever wished children came with an instruction booklet or that there was a “how to parent” book, I believe that Dr. Rimm has written one for you. It is called “How to Parent So Children Will Learn.” It is the survival manual for parents and teachers. She even offers step by step examples and sample dialogues. I had a wonderful talk with Dr. Rimm, and I hope that the information she has given me that I have put here helps anyone out there that is worried about being a good parent, or about making sure your child is the best that they can be. All children have the desire and the ability to be successful, you just have to know how to get it out of them. Biography Jennifer Shakeel is a writer and former nurse with over 12 years medical experience. As a mother of two incredible children with one on the way, I am here to share with you what I have learned about parenting and the joys and changes that take place during pregnancy. Together we can laugh and cry and rejoice in the fact that we are moms!